Welcome to our website. Enjoy your visit, and please, let us know what you think! At the Woodcarved Art Gallery, we bring new life to cut and dried trees, or found wood, in creating our art. Choosing just the right piece for a sculpture, Jim works in all types of wood, while Diane generally prefers basswood. 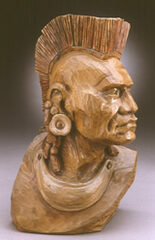 The carving at left is called "The Iroquois" and was carved by Jim in butternut. That's a hardwood tree which is softer to carve than walnut but has an equally beautiful grain. The color you see is natural. The Online Gallery will be seeing a lot of changes as our new home and workspace come together. Keep an eye on this website to see what new surprises develop. We will also be posting new gallery locations where our carvings will be available as well as updating our show calender with shows around the country where we'll be exhibiting. The carving you see at right is a regal looking Bald Eagle landing on a tree in hopes of catching the bunny before it escapes underground. 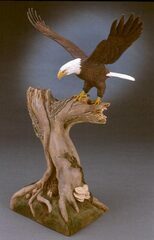 Diane carved the eagle out of basswood and the tree out of a block of willow. It's painted with washes of acrylic still allowing some of the natural tones of the wood to show through.